Kids: They grow up so fast, despite the injections of experimental hormones intended to delay the awkwardness of adolescence that might complicate branding efforts. 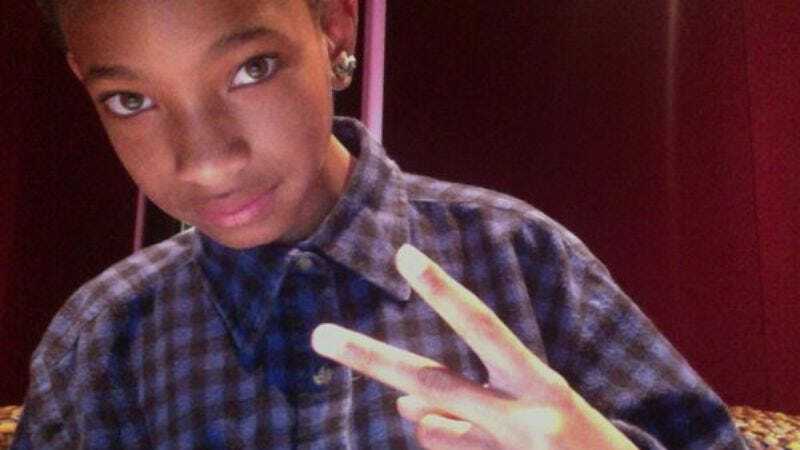 One day, Willow Smith is a carefree little girl who doesn't need your validation because she's determined to just be herself (the daughter of two insanely wealthy celebrities with talent development deals for all their children). The next, she's a 12-year-old into more grown-up things, like listening to Radiohead and expressing her angst in appropriately world-weary French. On her latest single—released under Smith's Soundcloud user name of Abre Mort (or "dead tree"), and located at the URL of "saulpleurant" (or "weeping willow")—Willow whips her ennui back and forth over the somber strains of "Codex" from King Of Limbs, moodily lamenting that she's "melancholy," that "society's always screaming at me," that she "just wants silence." At this rate, Willow will be doing Lydia Lunch-esque spoken-word pieces while stabbing out lit Gitanes on her arm by the age of 15.